The fourth incarnation of the Tonight Show franchise debuted on May 25, 1992, three days after Johnny Carson's retirement as host of the program. The program originated from NBC Studios in Burbank, California, and was broadcast Monday through Friday at 11:35 in the Eastern and Pacific time zones (10:35 Central/Mountain time). Unlike Carson or his predecessor Jack Paar, Leno only once used a guest host, preferring to host the series by himself. On August 22, 1994, Leno eulogized his father, who had recently died. After his monologue, Leno sat behind his desk and told the audience about his father's life and how his father had supported him in his career. Leno noted a moment when, upon Carson's disapproval at Leno being his successor, his father had encouraged him and told him to 'fight the good fight'. Leno ended the tribute saying, "You know, it really is lonely at the top. You have no idea. But... we'll fight the good fight, Pop." Following the September 11 attacks, The Tonight Show was off the air for about a week, as were most similar programs. The first post-9/11 episode began with a still image of an American flag and a subdued opening without the usual opening credits. 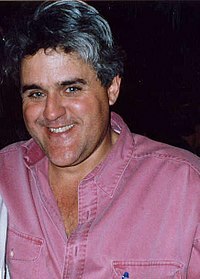 Leno's monologue paid tribute to those who lost their lives and to firefighters, police and rescue workers across the US. Leno had questioned whether a show that regularly poked fun at the government could continue after the attacks, but in his monologue he explained that he saw the show as a respite from the grim news of the world, akin to a cookie or glass of lemonade handed to a firefighter. Senator John McCain and the musical group Crosby Stills and Nash were featured guests. Leno also organized an auction for a Harley-Davidson motorcycle signed by celebrities (he signed his name on-stage), with the proceeds going to 9/11 support organizations. For an extended period after the attack, a short clip of a large American flag waving was shown in between the announcement of the musical guest and Leno's introduction during the opening montage. ^ "The Tonight Show with Jay Leno Season 19 Episode February 10, 2011 'Rob Lowe / Amber Riley / Nicki Minaj' Preview | Paparazzi Journal". Paparazzijournal.com. ^ "The Jay Leno Show". NBC.com. Retrieved August 13, 2009. ^ "Conan O'Brien: I Won't Do 'The Tonight Show' at 12:05AM". Zap2It.com. January 12, 2010. ^ "Branford Marsalis revealed he left 'The Tonight Show' because he wasn't going to play the role.". Highbeam Research. Retrieved January 17, 2013. ^ "Stern Rails Against Leno for Lifting 'Stuttering John'". Fox News Channel. February 24, 2004. ^ "NBC soars as others stumble". MediaLifeMagazine.com. May 2002. Retrieved February 7, 2014. ^ JAY LENO AND JIMMY FALLON FINISH No. 1 VS. ABC AND CBS COMPETITION IN THE MAY 2011 SWEEP NBCUniversal. June 3, 2011. Retrieved June 4, 2011. Archived December 3, 2013, at the Wayback Machine. ^ "Niente più Jay Leno su RaiSat Extra...". Antonio Genna. Retrieved May 12, 2008. ^ "Jimmy Kimmel till Kanal 5". August 6, 2008.